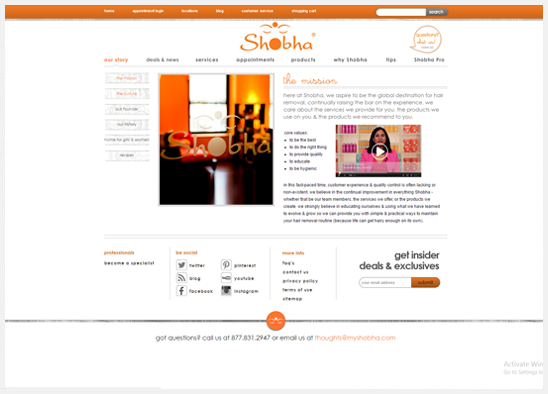 The shobha salon website (www.myshobha.com) was in need of a massive makeover. The site had an outdated e-commerce platform, a simplistic design, and zero integration with its appointment scheduling and CRM software, Harms Millennium. Shobha needed Plego’s proven expertise with custom e-Commerce platforms and Harms Millennium integration in order to create a site that was completely integrated, had optimum performance and cutting edge design. A custom e-commerce solution was created and implemented for myshobha.com. This allowed Plego to create a back-end interface between the website and the salon’s CRM software. The site became a virtual extension of their physical salon locations. By using the millennium sdk and other third party Api’s, Plego was able to establish a successful link between myShobha.com and Millennium. The site is now able to book appointments in real time, gain access to real time inventory of products, create gift certificates, and give clients access to their purchase and visit history.